Good things often come in little packages. 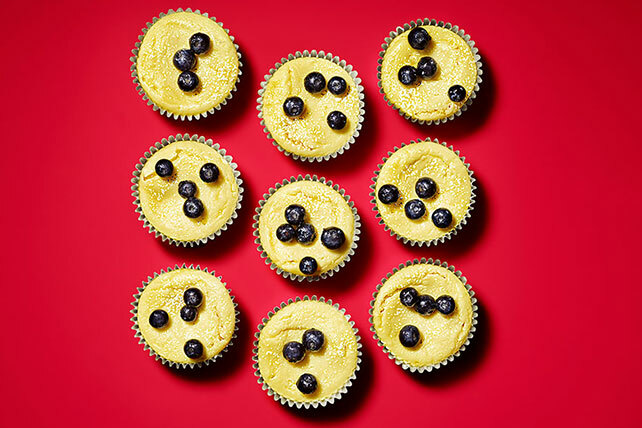 That's especially true for these adorable mini cheesecakes made with real lemon and blueberries. Mix dry cake mix, dressing and 1 egg until blended; spoon into 24 lined muffin cups, adding about 2 Tbsp. to each prepared cup. Beat cream cheese in small bowl with mixer until creamy. Add 1 cup sugar and lemon juice; mix well. Add remaining eggs, 1 at a time, mixing after each addition just until blended. Spoon into muffin cups. Bake 20 to 25 min. or until centers are almost set and edges are lightly browned. Cool in pans 10 min. Remove to wire racks; cool completely. Refrigerate 3 hours. Microwave marmalade in small microwaveable bowl on HIGH 10 sec. or just until warmed. Add blueberries; stir to evenly coat. Spoon over cheesecakes; sprinkle with remaining sugar. Place completely unwrapped package of cream cheese in microwaveable bowl. Microwave on HIGH 10 sec. or just until softened. Add 15 sec. for each additional package of cream cheese.